You can only use the effect of "Gimmick Puppet Egg Head" once per turn. You can discard 1 "Gimmick Puppet" monster, then activate 1 of these effects. :- Inflict 800 damage to your opponent. :- This ca.. When a "Gimmick Puppet" monster you control is destroyed by battle and sent to your Graveyard: You can banish that monster; Special Summon this card from your hand. You can only use the effect of "Gim..
You can Special Summon this card (from your hand) by Tributing 1 face-up Xyz Monster you control. You can only Special Summon "Gimmick Puppet Nightmare" once per turn this way. When you do: You can Sp..
During your Standby Phase: You can Tribute this card; Special Summon up to 2 "Heroic Challenger" monsters from your hand and/or Graveyard, except "Heroic Challenger - Ambush Soldier". You can only use.. When this card is Special Summoned by the effect of a "Heroic Challenger" monster: You can add 1 "Heroic Challenger" monster from your Deck to your hand. You can only use the effect of "Heroic Challen.. If this card is destroyed and sent to the Graveyard: You can Special Summon from your Deck, 2 Normal Monsters with different names whose ATK or DEF is 0, in face-up Defense Position. You can only use .. When this card declares an attack, it gains 500 ATK. If this card on the field is destroyed and sent to the Graveyard: You can Special Summon 1 Level 1 monster with 0 ATK and DEF from your Deck. Its e..
You can target 1 face-up Xyz Monster that has Xyz Material; detach 1 Xyz Material from it, and if you do, Special Summon 1 "Kurivolt" from your Deck. 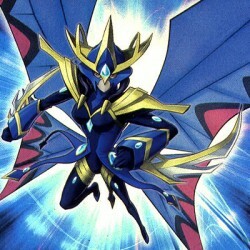 This card cannot be used as a Synchro Material Mon.. When this card is Normal Summoned: You can target 1 "Gogogo" monster in your Graveyard; Special Summon that target in face-up Defense Position, then change this card to Defense Position. If this card .. When an opponent's monster declares a direct attack: You can Special Summon this card from your hand. When this face-up card is targeted for an attack: You can discard 1 card; this card cannot be dest.. Cannot be Normal Summoned or Set. Must be Special Summoned (from your hand) by controlling no cards, and cannot be Special Summoned by other ways. You cannot conduct your Battle Phase the turn you Spe..
A warrior that fights with his bare hands!!!.. 3 Level 1 monsters. This face-up Attack Position card cannot be destroyed by battle. When you take battle damage from battles involving this card: Inflict damage to your opponent equal to the amount o..
2 Level 8 monsters. Up to twice per turn, during your Main Phase 1: You can detach 1 Xyz Material from this card, then target 1 Special Summoned monster your opponent controls; destroy it, then if it ..
2 Level 4 monsters. Once per turn: You can detach 1 Xyz Material from this card, then target 1 face-up monster your opponent controls; destroy it, unless your opponent pays 1000 Life Points to negate ..